When you have a car you no longer need, finding a place to sell it for a good price is not always easy. Selling to private buyers means the car has to be in perfect condition, making a challenge for those with junk cars on hand, and dealerships are typically looking to give rock-bottom prices for trade ins. When you need cash and want it quickly, Auto Parts City is the answer. Serving drivers in Northern Illinois and Southern Wisconsin, Auto Parts City is an auto salvage yard that buys used cars, including junk vehicles, and offers fair pricing. Visit us today for a no-obligation quote for your used or junk car, and see how much cash you could get for your car, truck, van or SUV easily. Are you looking for cash for your junk or used car? Auto Parts City is the premier used car buyer in the greater Chicago area. We know how to properly value used and junk cars of all conditions, makes and models and offer fair pricing paid on the spot. If you have a junk car, used car or vehicle you no longer need, get cash for it with one stop at Auto Parts City. 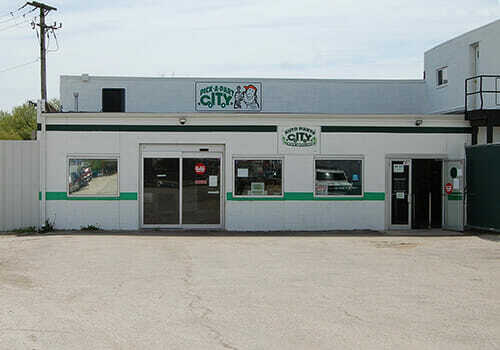 Why Choose Auto Parts City? Why should you choose Auto Parts City when you are looking to junk a car? The answer is simple! First, we provide top prices for your car. We will consider its year, make, model and condition and provide fair pricing without hassle. Stop trying to find a buyer for your car when Auto Parts City is always buying. Another reason to choose us when you are wondering, “Where can I junk my car for cash?” is because we are dedicating to doing things in the most environmentally friendly way possible. When cars come to us, we thoroughly inspect them to decide if they are junk cars or worthy of resale. Cars that are still in good, working order are sold through City Auto Sales, where used car buyers find great prices on quality vehicles. Cars that are junked head to our salvage yard, where every bit is recycled. From draining and recycling all of the fluids to even recycling the metal and glass that cannot be salvaged, our team is dedicated to using every bit of the vehicle. Don’t struggle with having a car you no longer need when you could have cash in your pocket instead. Bring it to Auto Parts City to sell it to us, and do your part to protect the environment while making a little money at the same time! Auto Parts City makes it easy to sell your junk car for cash. All you need is a clean and clear title. Then, stop by our recycling facility with your car and title in hand, and we will evaluate your car and pay you for it on the spot. If your car doesn’t run, that’s OK! Just have it towed to Auto Parts City, and we will take care of it from there. We take cars in all conditions, including those that have been wrecked or are no longer functional as well as good quality used cars. Let us take the car off your hands and offer fair pricing at the same time!